Now how on earth did you do that? Fabulous! My gosh, this is so very beautiful! 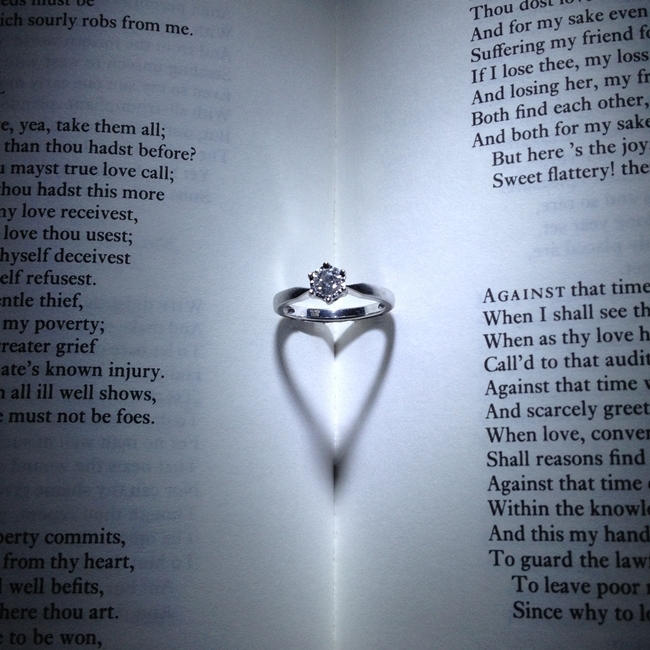 When I did this it took loads of goes trying to get the book/ring balance right! That's so lovely & a perfect picture. Love the heart shadow effect - very clever. Beautiful shot - love it! Hello! I came over to visit after you visited me and your blog is beautiful! This post really caught my eye and the idea of "silent sunday" as well! Would you mind if I "copied" (lol, for lack of a better term) and started a silent sunday post on my own blog? I think it's a perfect way to post for sundays?? Thank you so much, I'm glad you like it. I link up with cosmicgirlie for Silent Sunday. It's her idea and it's good fun. Here is the link for you if you would like to join http://www.cosmicgirlie.com/silent-sunday.